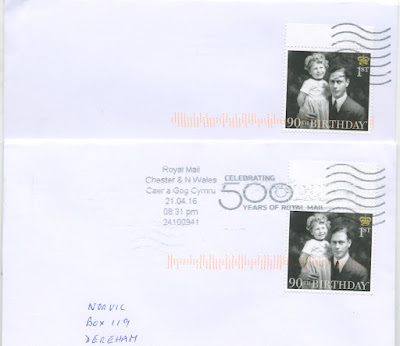 This blogpost will be used to record the slogan postmarks in use in April 2016. Coinciding with today's issue of the stamps marking the 400th Anniversary of the Death of William Shakespeare is a slogan postmark also marking the anniversary and linking to a Royal Mail micro-site. UPDATE: According to Royal Mail's 5 April press release, "From Tuesday 5 April until Saturday 9 April, a special postmark will be applied to UK stamped mail" - which means it was applied to mail from Monday 4 April. 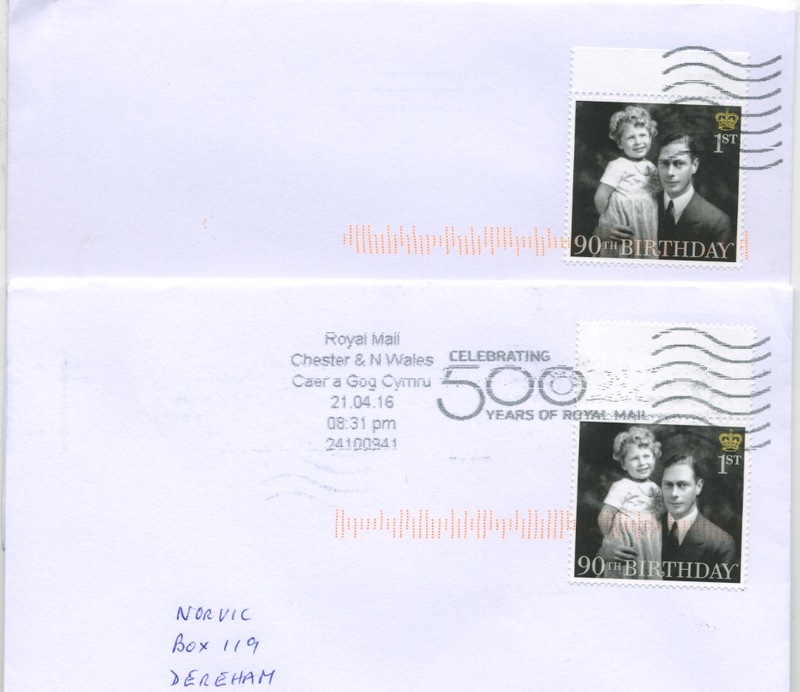 There was apparently no slogan postmark to mark the 90th Birthday of Her Majesty The Queen, thus denying collectors the opportunity to get first day covers with that slogan. I tried while I was in Shropshire and Wales but the effort came to naught! The upper one was posted in Montgomery and the lower in Craven Arms. Royal Mail followed the Shakespeare slogan (not extended to his birthday on 23 April) with one for St George's Day. Predictably there is no press release for this so I can't tell when it was intended to be used. I have examples on 1st class mail from S E Anglia (Chelmsford) on 22 April and an unclear one from NW Midlands. Chester and Bristol MCs on the other hand continued to use this through to 25 April! On 21st, Bristol was using the Royal Mail 500 slogan, which is the current default apparently, and was also in use on 25th in Glasgow. "That it should come to this!". - Hamlet (Act I, Scene II).